Home » A Greener Workplace Through Leveraging Technology – Is it possible? A Greener Workplace Through Leveraging Technology – Is it possible? Green workplaces have recently been all the rage, with many businesses investing in green technologies at quite some cost. You might think that it can be an expensive endeavor that’s not really feasible for a business trying to make its way to the top. However, recent studies demonstrate that employing technology to create a greener workplace could help out the bottom line. You can make a greener workplace by encouraging and implementing better technology in areas such as office design, equipment, software, hardware and employee commutes. By following some of the recommendations below, your workplace can be a greener, healthier and more productive. While switching the lights off when leaving a room might seem to be inconsequential in terms of savings, over the long run it may result in a noticeable difference. Try implementing policies that require all peripheral equipment such as printers and scanners to be switched off and unplugged when not in use. Save power by setting computers to turn off after a set period of not being in use. One of the most efficient of technologies to save energy that I found is the eco button, which is a USB device that you can use to switch off your computer with a single touch. Consider investing in smart strips that turn off multiple devices with one switch. How many times have you written two lines on a document only to crumple up the paper and throw it in the trash? We use a lot of paper that not only increases costs but is destructive to the environment. Unfortunately, we can’t completely get rid of paper just yet. Nevertheless, you can still have benefit from technological advancements to make the workplace a better place. Make use of safe and innovative cloud solutions such as Google Drive. It is relatively cheap given that it eliminates the need for physical backups of your records. Perform most of your document reviews onscreen rather than printing the document every time. With software such as GreenPrint, you can remove any blank pages in your documents and make them more accessible for printing. Educate and incentivize carpooling, public transit, biking and walking as viable and less stressful alternatives that will help make the workplace greener. Encourage employees to adopt car-pooling as a practice. It will leave most of them less stressful. Ride-sharing services are also more freely available than they’ve ever been. 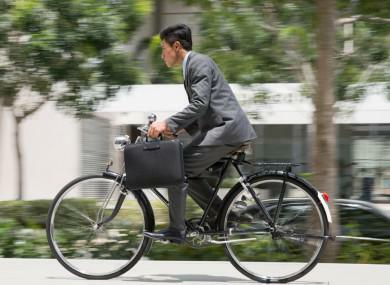 Encourage employees to bike to work. It is not only an eco-friendly means of transport, but one of the fastest ways of getting around on streets clogged with vehicular traffic. There are advanced bikes and folding bikes that are very convenient in crowded cities. See if your company can help cover some of their costs. The internet presents you with innovative technologies that will enable you to make the workplace greener through telecommuting. Advanced technologies such as instant messaging and video conferencing can result in significant advantages by cutting out the costs of the commute altogether. However, I have to assert that while a telecommuting framework is cost-efficient and creates a greener workplace, it comes with security risks to your company’s data. I would recommend you use a Virtual Private Network (VPN) to ensure the security of your corporate data from hackers. As some of your employees may use public networks that may be lacking the protection your sensitive information deserves. A VPN will encrypt device connections to keep hackers out. Switch to using paper and envelopes made using recyclable and green technologies. For your cleaning needs, try using biodegradable eco-friendly products that will not only make for a safe workplace but also reduce your ecological footprint. Recycle printer cartridges. According to this study refillable cartridges are usually cheaper than buying new. Use paper or cloth towels made from recyclable materials. Also use biodegradable soaps, pens and pencils. You can adopt a cradle to cradle model in the redesign of the workplace for huge savings. The cradle-to-cradle model makes use of recycled materials to create recyclable products. 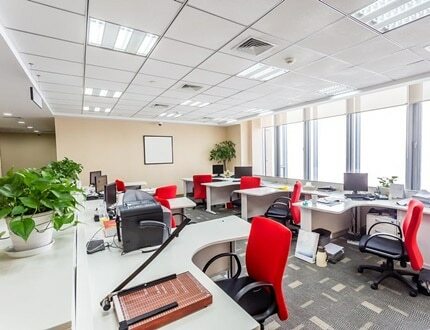 For your overhead lighting and desk needs, adopt the energy efficient LED and Compact Fluorescent (CFL) lights for huge savings over the long term. 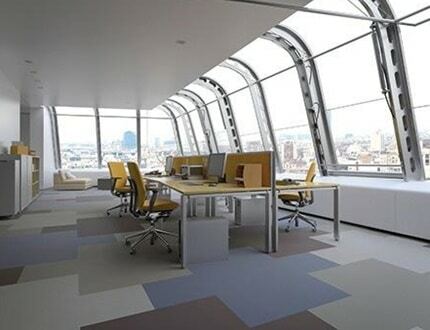 Take advantage of modern architectural design and floor planning to leverage natural daylight for the workplace. Implementing a greener workplace strategy through technology will make the workplace a more productive and healthier one for your employees. Employing such an approach will enable you to improve your organization and have an edge over competing firms. Alsco would like to thank Catherine Black of Secure Thoughts for contributing this article for Greenroom. Secure Thoughts is the industry leader in helping people make sure their information and loved ones’ are protected online. For more green solutions for your business, visit the Greenroom blog. Spread the word about how easy it is to create a greener, safer and healthier workplace.